Glenda, I did have fun going through heaps of your posts and have printed out heaps of recipes. I am bored with my own cooking and feel that I’m doing the same old thing time over – and need some new ideas. I have loads of cookbooks and obviously the internet will deliver a lot – but I don’t think I have to look much further than your blog as you seem to like the same sort of things I do and most of your recipes are doable and the family should love them. Thank you, so much, Clare, for the lovely comment. All this is relevant because the other day I was on the look out for a post. I haven’t done a food post for a while and decided to make a special dish that I thought would be a real winner. As it turned out, it left a lot to be desired. Damn it! Now I was desperate for a post. I started searching my cook books for another possibility. I had books piled high in front of me and still I could not find anything that felt right. “I’ll try Cuisine Magazine,” I said to Maus. Maus brought out a pile of magazines and I immediately picked one that had little tags in it. I had been through this magazine before and liked a few of the recipes. The first one I read was this recipe. As I read through the ingredients, I mentally ticked them off, “Yes, I have this and, yes, I have that.” All I needed to buy was the chicken. * “I am set, ” I exclaimed. I made the dish and it was a winner. I have now gone back to the magazine for the purpose of preparing this post and noticed that the recipe is by Ray McVinnie. Most recipes I make from Cuisine Magazine are by Ray. Clearly, I like his style of food. The recipes on this blog are the result of me trying a select few recipes from my 150 or so cookbooks and all my cooking magazines. The cookbooks and magazines I own are a small sample of what I could own and the recipes are a small sample of what is in those books. Not all the recipes I try make it to the blog for they are not all winners. In fact, I cook much more than appears here. It is interesting that, on a certain day, I can flick through 6 cookbooks and not find anything that appeals. A collection of recipes is very personal and the result of much filtering. It is one time when the law makes sense, for it is my understanding that there is no copyright on a recipe but there is on a collection of recipes. *Buying chicken drumsticks in a country town is much harder than you can imagine. Chicken only comes in on certain days. When Maus went shopping, she was told it would be in later that day. When I went early the next day, I was told it was sold out. I tried two supermarkets and two butchers. There was not a chicken drumstick to be found in Bridgetown so off to the next town I drove (40 kms away). This recipe is from Issue 160, September 2013, Cuisine Magazine, and serves 4- 6. Ray McVinnie explains that jamoncitos means ‘little hams’ in Spanish, which is what the drumsticks, supposedly, look like. 400g can cherry tomatoes in juice (I used 400g of fresh cherry tomatoes. I have cherry tomatoes galore, therefore, wasn’t about to buy a tin of them). Blanch the peeled whole garlic cloves in boiling water for 4 minutes then drain and set aside to cool. Cut the bone end off each drumstick and push the meat down the bone so the bone is exposed. 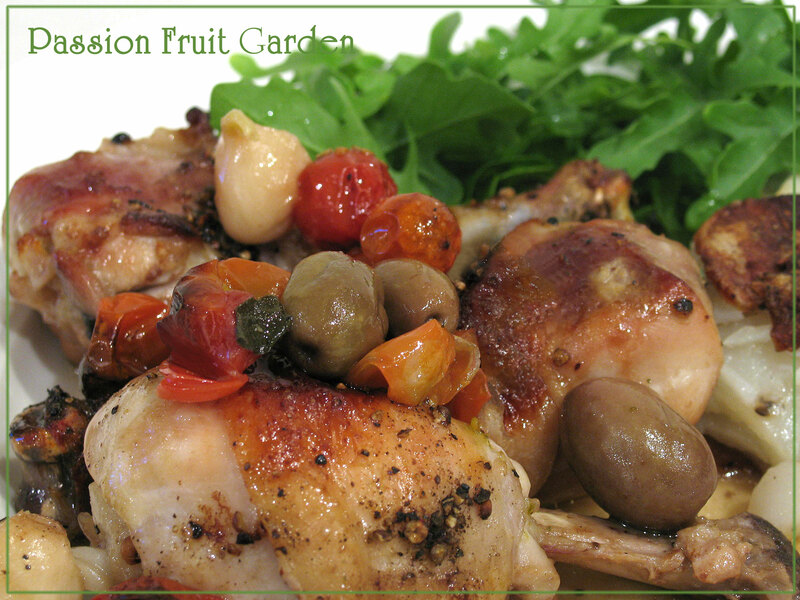 Put the chicken, oil, preserved lemon, oregano, bay leaves, garlic, olives, figs and sherry into a baking dish. Ensure all the ingredients are evenly distributed in a single layer. Cover and refrigerate for 2 hours. (My 2 hours was about 10 minutes whilst I was getting the other ingredients ready. I don’t think it made much difference to the final dish). Pour the stock and tomatoes over the other ingredients then season with salt and coarsely ground black pepper. Sprinkle everything with the sugar. Roast for approximately one hour or until the chicken is cooked to your liking. Serve with rocket and the potato galette . I used a soufflé dish for my galette. I lined the bottom with baking paper but not the sides. As it was, the sides stuck a bit so I will line both next time. Put the potatoes in a bowl. Add the oil and season well with salt and pepper. Arrange the potato slices in the prepared dish, layering them so you have a potato “cake” that’s 3cm – 4cm thick. Remove from the oven and turn out onto a plate. Flip it again to return it to the right way up. Slice into wedges and serve with the chicken. This entry was posted in Chicken & Duck, Something Simple, What's for dinner? and tagged One dish dinner, Ray McVinnie, What to do with excess cherry tomatoes? by Glenda. Bookmark the permalink. It’s a coincidence but I happen to have sone jamoncitos marinating in my fridge. I’ll have to save your recipe for next time. Sounds delicious. That looks like a fantastic meal Glenda. Isn’t it funny how, no matter how many recipe books or online recipes you look at, sometimes nothing strikes you. I can relate to that feeling though of getting bored with making the same old thing. I’m lucky in that my husband never complains & actually keeps asking for repeats but sometimes it gets overdone to the point where I can’t look at certain meals. Hard to believe you have such a time getting chicken legs though – that’s one thing we can always count on finding around here. Hi Diane, You would think with the number of books I have I could find something to make:) I have lots of recipes I would be happy to repeat but I am always on the lookout for something new for the blog. That is one of the cons of blogging. Chicken is a bit tricky to get in Bridgetown. It is only a small town and chicken has a short shelf life so I guess the shops don’t get much in. You can usually get a full chicken but I wanted drumsticks. You’re right about finding something new or interesting to blog about Glenda. That’s interesting about the chicken leg shortage but I guess it does make sense if the place is too small to keep all the parts fresh. So, is it easier to get chicken breasts? I’m a drumstick fan but it always seems like most recipes do stuff w/the breasts. What a lovely email from Clare. I haven’t been online much lately but your culinary influence, and others’, hums along behind the scenes. I will get around to posting details but in the meantime sorted and consolidated my small cookbook collection, bought a few kitchen gadgets and tried new blogger inspired recipes. Wow long way to drive, we are just starting to build 30 mins out of Boyup Brook so that could be me one day. I may have to retrain and stock up on groceries. I want more chickens and maybe a few goats. Love your blog especially the roses. Hi Julie, thanks for stopping by and commenting. I was lucky, I got them in Manjimup. You certainly will need to stock up unless you want to be driving into Boyup Brook every day. Wow, that’s a long way to get chicken drumsticks! Sounds like a lovely recipe, Glenda. I’m going to have to try this! I have not enjoyed dried figs. Perhaps I was introduced to them too early in life? Or maybe because they were served as part of a fruit salad and all I can remember is the seeds.getting between my teeth. It’s odd because I love fresh figs both cooked and raw. Hi Pat, It is funny I love dried figs but am not particularly partial to the raw ones unless they say grilled with prosciutto wrapped around them.